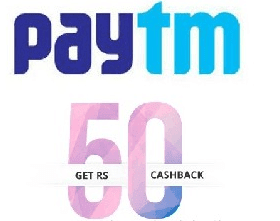 As digitalizing india paytm have a great role in recharge and bill payment.Recently paytm presents Cashback offer.Paytm FIFTY offer is one of them.In this offer you will get Free Rs.50 Cashback on Recharge of Rs.100 or more. This offer is valid for all users. But only valid for those Mobile Number which you never used in Paytm as Recharge purpose. So now Recharge your Mobile Number at Paytm using coupon code and get Rs.50 Free Cashback in Paytm wallet. Initiate Recharge of Rs.100 or more (Use New Number which is never used in Paytm for Recharge). Apply Promo code – FIFTY to get free Rs.50 cashback. Finally Rs.50 cashback will be credited in your Paytm wallet.